Houghton Mifflin Harcourt, 9780544273177, 240pp. A leading psychologist reveals how our most misunderstood emotion—pride—has shaped our minds and our culture, and shows how we can harness its power. Why did Paul Gauguin abandon middle-class life to follow the path of a starving artist? What explains the massive success of Steve Jobs, a man with great ideas but weak programming skills and a questionable managerial style? How did Dean Karnazes—the famed “Ultramarathon Man”—transform himself from a directionless desk jockey into an extreme athlete who once ran fifty marathons in fifty days? 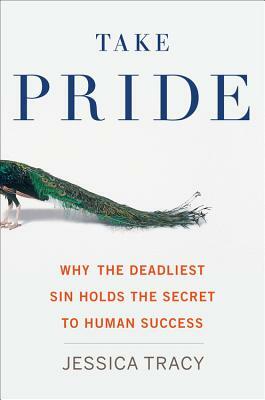 As the renowned emotion researcher Jessica Tracy reveals in Take Pride, each of these superachievers has been motivated by an often maligned emotion: pride. Its dark, hubristic side is well known, but Tracy shows that pride is also essential for helping us become our best, brightest selves. By making us care about how others see us and how we see ourselves, pride makes us strive for excellence. In the right doses and the right contexts, it has been proven to boost creativity, motivate altruism, and confer power and prestige on those who display it. But while pride can inspire feats of genius, Tracy explains, it can also compel acts of apparent insanity and spectacular self-destructiveness, causing some people to seek status not through hard work but through intimidation, deception, and self-aggrandizement. Avoiding the bad kind of pride while nurturing the good kind might just be the secret to success. In Take Pride, Tracy explains why our species came to feel pride in both its good and bad varieties, and how we can make this double-edged emotion serve us—rather than the other way around. JESSICA TRACY is professor of psychology at the University of British Columbia in Vancouver, Canada, where she also directs the Emotion & Self Lab. She received her Ph.D. from the University of California, Davis, in 2005. Her research focuses on emotions and emotion expressions, and, in particular, those emotions that are most intricately intertwined with our sense of self: pride, shame, and guilt. She has coedited two academic volumes, The Self-Conscious Emotions and The Psychology of Social Status, and has published over eighty journal articles, book chapters, and theoretical reviews in psychology and interdisciplinary science journals. Winner of the James McKeen Cattell Dissertation Award from the New York Academy of Sciences and of the International Society for Self and Identity Early Career Award, she has had her research findings covered by hundreds of media outlets, including ABC’s Good Morning America, NPR’s All Things Considered, the New York Times, The Economist, and Scientific American. Tracy was born and raised in Washington, D.C., and now lives in Vancouver with her daughter, her partner, and their small dog. “Pride drives us to success and achievement, but also arrogance and hubris. Tracing its roots to primate social dominance, Jessica Tracy found that humans everywhere express this emotion the same way. Here she offers an eye-opening discussion of both its indispensability and pitfalls.” —Frans de Waal, bestselling author of Are We Smart Enough to Know How Smart Animals Are?